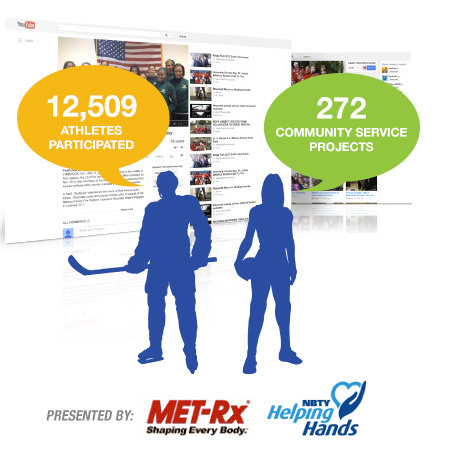 For the 2014 – 2015 school year, Team Up 4 Community and NBTY Helping Hands / Met-RX set the challenge to encourage our Youth Athletes to give back $300,000 worth of service throughout our L.I. Communities and Participate in the Largest L.I. Sports Community Service Challenge. The Youth Athletes EXCEEDED this goal by completing over $358,000 in value of service to their communities! Recognizing that community service helps promote responsibility and character in young people, TeamUp4Community partnered with Met-Rx and NBTY Helping Hands in the “L.I. $300K Sports Give Back Challenge,” an interactive contest that challenged our Long Island Athletes to compete in service projects this past school year. This challenge encouraged community service among student athletes between the ages of 6 and 24. The Challenged successfully completed with submissions totaling 49,437 hours of community service work performed by over 12,000 Youth Athletes between September 1, 2014 to June 30, 2015. The value of their time served in the community is worth over $358,418 given back in service. TU4C engages and empowers youth athletes and others to initiate community service projects through its online challenges. The platform also provides them with an interactive set of resources to advocate and promote their social responsibility amongst their peers, family, schools, organizations and communities. TU4C serves as central hub and a launching pad to help develop new programs to meet athletes, organizations, and community needs. Team Up 4 Community’s Online Challenges are making community service contagious! Congratulations to the winners – $10,000 in Scholarships and Grants was awarded! View All Entries on YouTube!